Ramon has registered copyright of his songs with Copyright House. 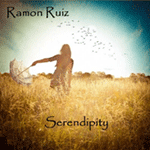 Ramon Ruiz is a versatile singer, songwriter, guitarist and teacher. He first started performing at local open mic nights in Scotland a far cry from the international audience he is now gaining having performed in London, Tenerife, and New York(Central Park). Song writing has always come easily to Ramon, he could easily write 2 or 3 songs in a weekend. However, being a devoted husband and father of 3 daughters he doesn't write as much as he could, choosing to put his family first, quite right Ramon! Rather modestly Ramon says that he doesn't think his style is particularly distinctive or different, I have to disagree with this. I think his songs combine various styles, blended seamlessly together to create his own unique sound. I think that his songs have a soulful folk quality with melodies reminiscent of catchy '60s melodies, captured in a contemporary style. They are expertly crafted songs and his strong, smooth voice delivers each line with a depth of expression that is both beautiful and uplifting. 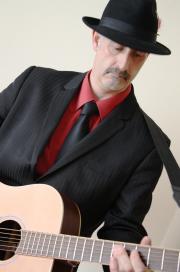 As a guitarist Ramon's abundance of skills range from classical to jazz, slide blues to mandolin and rock guitar to bass guitar to name but a few. This would go towards explaining how Ramon's solo guitar music provides as much intriguing fusion of styles as his songs. His acoustic guitar compositions often have a funky, Spanish feel. While his solo electric guitar compositions combine jazz and blues in his own inimitable style. Soulful folk, contemporary '60s, funky Spanish, how can this be I hear you cry?! Well you can find out for yourself by visiting Ramon's website (see below) where you can hear various demos and purchase the 2 recordings that Ramon has already made. The first recording is a 10 track acoustic album entitled Serendipity and the second is a 4 track EP called Peppercorn Rent. If you are lucky enough to live in Lanarkshire, you could have lessons with Ramon and benefit from his 25 years of playing experience. Ramon is an RGT registered teacher provides private tuition for all styles of guitar playing. He will also be running a number of workshops from June 2012 onwards, please visit his website for more information. So what does the future hold for Ramon? Well, at the end of August 2012 he will have a new recording available, a 10 track album entitled Life's Contradiction. He is currently in talks with an American film company that are interested in using 2 of his songs in a forthcoming production (good job you've them copyright registered with Copyright House Ramon!) and he will be trying to gain some Russian fans with a performance in St Petersburg in 2013.